So, what think you? Comments and suggestions welcome. 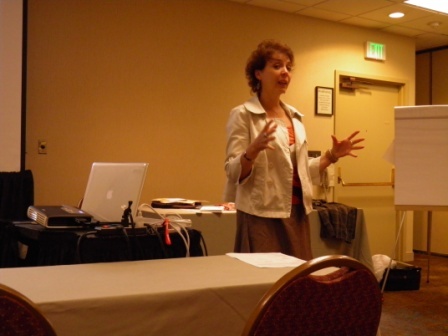 One of my favorite classes from conference was titled Working with Your Pattterns for Fit and Creativity, taught by Susan Lazear, a teacher in the fashion program at Mesa College in San Diego. Contrary to many sewing instructors, Susan is not keen on using fitting muslins. Her approach is to measure clothing that you already have in your closet to learn the garment measurements you prefer, and then to use that information to modify commercial patterns. For example, if you have a v-neck t-shirt that you really like, measure both the length and width of the neck opening. Use those numbers to help you tweak the fit on all shirts and dress patterns calling for a v-neck. 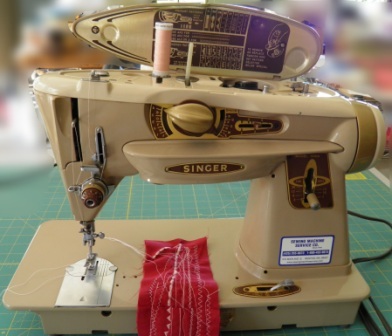 Susan also developed a software program named Garment Designer by Cochenille Design Studio to help sewists with fitting problems. I have not used this software program, tho I have to admit it looked rather intriguing. The main reason I have balked at all of the pattern-making software programs is the Scoth tape issue. The thought of taping up a million or so sheets of 8.5×11 inch paper and driving to the store every week for a new ink supply has no appeal. None whatsoever. Simply BOR-ring! But Garment Designer caught my eye, so I may have to investigate this one a bit. What are your thoughts? 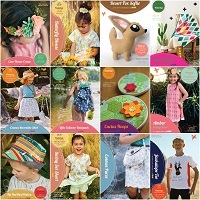 Do you use any pattern-making software? What do you like and what do you dislike? 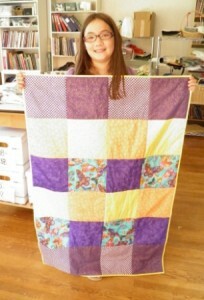 What a great accomplishment – a completed quilt! Personally, I have started more than one quilt, but have not been so successful with actually finishing them. My young student, Kathryn, has been working on this quilt for the past few sewing sessions, and today she finished it up. What a great job she did! She coordinated a nice selection of fabrics, laid them out in a pleasing arrangement, and stitched them together nice and accurately, too. There were lots of decisions along the way, a bit o’ ripping, and plenty of hard work. Today was the day we stitched on the binding, and called it good. I am really proud of Kathryn. As I mentioned earlier, actually completing quilts is not my strong suit, so I bow to anyone who can cross the finish line. Great job, Kathryn – keep sewing! Well, I am physically (if not exactly mentally) back from my very first ASG Conference. It was really, really, REALLY great. 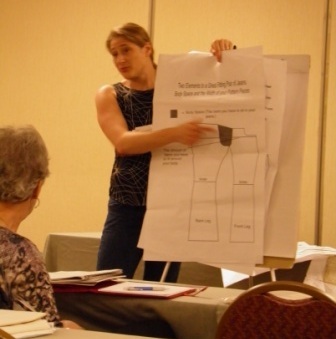 I took an all-day jeans fitting workshop with Jennifer Stern last Thursday (pictured above), and then Friday thru Sunday I took 3 workshops each and every day. What a great collection of instructors and sewing nerds! It was just as informative and fun to talk with women from all around the country as it was to hear what the teachers shared in ther lectures and demos. I think my favorite class turned out to be Susan Lazear’s Working with Your Pattterns for Fit and Creativity. I switched into this class on Sunday at the last minute, and boy am I glad I did. Susan is AWESOME. 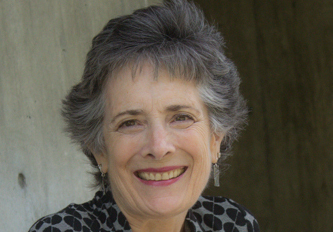 She owns Cochenille Design Studio, and developed a nifty software program titled Garment Designer to help women with fit and styling issues. I really dug her logical, analytical approach to improving fit using commmercial patterns, and hope to be implementing some changes in my processes based on her recommendations. So now it is back to dishes, toilets, cooking, and taking care of the pooch. Ah well, LA was great while it lasted, and you will be hearing more (much more!) on this subject very soon. …tomorrow morning for the ASG conference in Los Angeles. 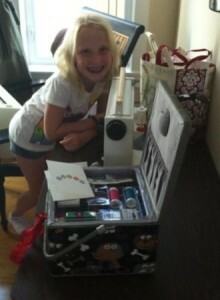 Time permitting, I will try to post about the fun classes I am taking and the awesome sewing nerds I hope to meet. Until I return on the 22nd, the blog may be a little quiet. Here is a little eye candy for the next week – my very own Rocketeer! Saaaaaa-weeeeeeeeeeeet! Singer 500, also known as the Rockeeter. Bet you are SO jealous! I love the retro vibe, but I do not have many things in my closet that could be classified as vintage styling. I think I just might change that! I fell in love with this Butterick pattern, and decided it would be a fun dress to make and wear at the ASG Fashion Show. So I found some darling Betsy Johnson embroidered cotton black dot fabric that suited this pattern to a T, and made up a quick muslin of the top to check the placement of that V-neckline. It needed a little adjusting and I was all set. 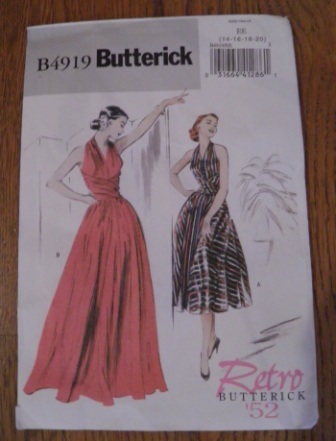 One of the things I liked about this pattern was the dress has a full back – which of course means I can still wear a bra but it looks like a halter-ish style from the front. And I double-heart the tie in the back! OK, maybe I didn’t get that tied very well, but you get the idea. A couple of long wrap around ends that cross in the front and then tie in the back. Cute, eh? 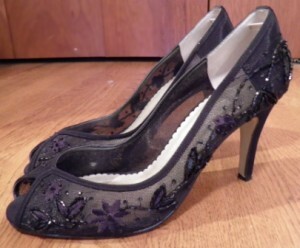 And are these the perfect shoes for the dress or what?!? They might be “15 minute” shoes, but I will at least look good walking into the room. All I have to do is make it to my table and sit down for dinner. I can slip them off under the table if they are killers. Peep toe beaded black shoes! 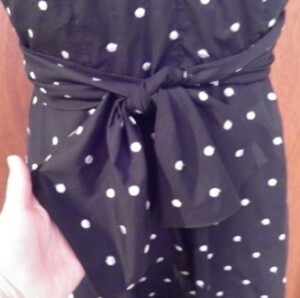 Now I wonder if I can get another dress or skirt done today…. In just a few days I will be heading to Los Angeles for my first ever American Sewing Guild Conference. 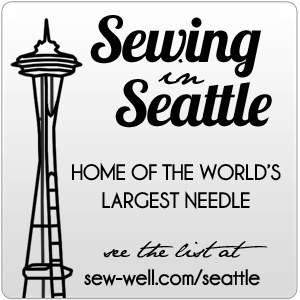 This is where all the REALLY BIG sewing nerds collect once a year to take classes and geek out on all things sewing. Right up my alley! The two classes I am most excited about are the all-day Jeans Fitting workshop taught by Jennifer Haseman (aka Jennifer Stern on patternreview.com), and her Professional Techniques for Jeans Construction session which should add the icing to my jeans-making. Eeeck! Total geek out! Like everyone else, I love wearing jeans, and am always looking for ways to improve fitting and construction techniques for myself and my students. I am also totally pumped about the session on men’s sportswear. There is not much out there about sewing for men, and it should be fun to learn a few more techniques for the man men in my life. Other classes on my agenda include Fibers and Fabrics (might get to burn stuff! ), some seam and hem finish workshops, a bit o’ Vintage Inspiration, making purses with “professional flair”, and how to work with sheer fabrics. Nothing but fun times ahead for me. A couple of days of vaca with my DH before deep immersion into all things sewing. Heaven! Lycra – love it or hate it? Lycra® (or spandex), is that wonderfully stretchy fiber added to lots of fabric and RTW clothing these days. It was originally developed by DuPont (now Invista) in 1958 as an alternative to rubber. How about you? Are you a lycra lover or hater? Or somewhere in the middle, like me?